I came up with the following schematic using SPDT-Relays, if you know of DPDT-Relays that work nicely with arduinos and I could order off amazon.de, that would make things a lot easier. Problem No. 1 with this approach is that the mechanical 0 signal does not overrule the arduino. I guess I would have to read the signal into the arduino and make an if case for switching the relay? Problem No. 2 is that I think the arduino can't handle the 14 Relays (I have only an 8-channel at the moment) Based on the specification I found in an amazon description it needs 20mA for every relay, with 14 coming to a total draw of 280mA which is above the 200mA rating for the output pins of an arduino I found online. I'm guessing a possible solution could be using transistors to switch the relays? One other idea I had would be using NOT-Gates with NPN-Transistors, since the maximum power draw of the valves seems to be 500mA at 12V (fuse in the commercial box is 500mA, the real current is probably lower). This would require 14 NPN-transistors if I'm not mistaken, which I have already. There is also probably an easy way to use some logic gates to get the "overruling" of the mechanical switches. As a quick background on why I want to do this: The equipment I want to control is an agricultural sprayer. Ours has 7 zones which can be turned on and off with mechanical switches. Earlier this year we built a diy-solution for autosteering the tractor (Cerea) and now want to control the sprayer at the same time. The arduino receives signals over the serial connection from the computer running the autosteering program. The signals determine which zones should be turned on, based on where the sprayer has already been. The manual override of individual zones is helpful at the sides of the field which the autosteering software doesn't know about. If you have any ideas how to implement this let me know! I believe this is the simplest solution. The relay is either ready-made module (e.g like this 5V or 12V version with 8 DPDT switches) or any relays of your choice with logic-level gate MOSFET switch. Figure 1. (a) What you've got. (b) Micro-control AND function but with no manual override. (c) Micro-control AND function with manual override. Solenoid polarity is controlled by RLY3, etc. 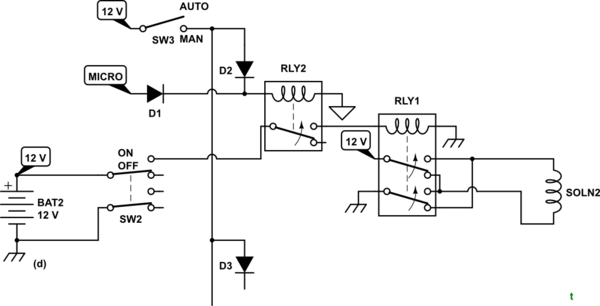 This simplifies the rest of the circuit to controlling a single polarity +12 signal. In AUTO mode both the micro-controller controlled relay has to be on AND the solenoid switch has to be on to energise the solenoid relay. In MANUAL mode +12 V is fed to each of the manual switches via a diode. The diode prevents back-feeds from one channel to another. Sw4 could be replaced by a relay fed from the micro-controller's 5 V supply or another GPIO pin permanently high. If the micro shuts down then the relay would drop out and enable manual control. There are many relay modules available to be driven from the micro-controller. Most of these have transistor or opto-isolator inputs and will only draw about 10 mA from the micro-controller GPIO. Figure 2. A further option. This solution may result in less disturbance of the manual control box wiring. Table 1. The OP's original table. 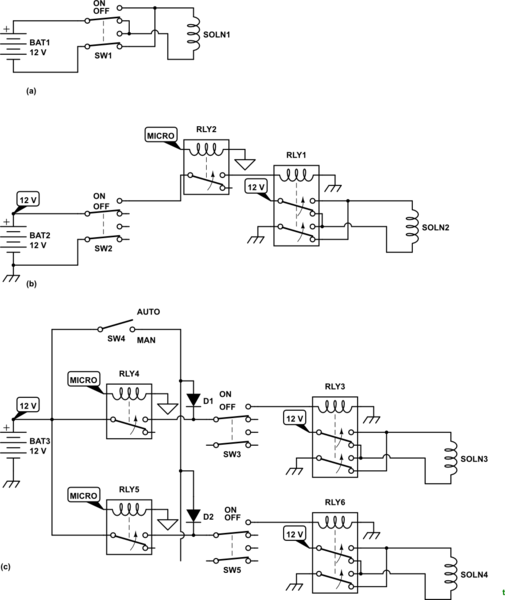 Using Maple's design but inverting the logic signal for the micro-controlled relay makes the solution much simpler. Table 2. 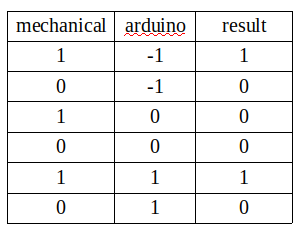 The OP's original table modified with negative logic on the micro-controller. Not the answer you're looking for? Browse other questions tagged arduino relay dpdt or ask your own question. How can I control brightness of a CFL with a microcontroller? Separated powers and high power switches? Alternatives to relais?